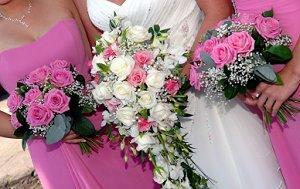 Pink and white is a popular color combination. Ideas for choosing the right wedding colors can help couples transform a plain celebration into a color-coordinated event. There are many considerations when selecting a palette of pleasing hues. 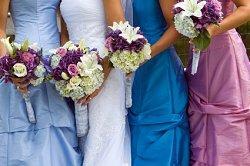 A few helpful tips guide a couple in creating their ideal wedding celebration with the right color selections. Season: Choosing colors that will be naturally abundant during your wedding season can help your event coordinate with the surrounding landscape and natural beauty. Formality: Very unusual colors are generally not the best choices for extremely formal, sophisticated events, while a starkly monochrome palette of subdued hues is too limiting for a casual, informal wedding. Personal Appearance: The couple should consider the skin and hair colors not only of themselves, but also of their bridal party members to ensure that certain colors do not look naturally poor on anyone. Location: For a well coordinated event, the couple should consider the décor at the wedding ceremony and reception sites, including wall color, carpeting, and other accents. Culture: Certain colors are very meaningful in particular cultures. 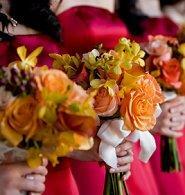 Red, for example, is a favored color for Chinese weddings because it symbolizes good fortune. Sentiment: Favorite colors are a significant factor in exploring wedding color ideas, and couples can also choose colors for other sentimental reasons. An accent color chosen in honor of a recently passed away grandparent, for example, can bring subtle symbolism to the wedding décor without being obtrusive on the happiness of the day. Some wedding colors are naturally associated with different seasons, and brides interested in a natural, coordinated look to their celebration will keep the season in mind as they plan their wedding palette. Spring Colors: Spring is a time of new blooms and rejuvenation, making pastel tones and lighter colors more popular. Pinks, yellows, and greens are especially popular in spring. Summer Colors: Summer wedding colors include the bold colors of plants in full bloom, and rich shades of reds, blues, and yellows are always good choices. More exotic shades such as magenta, teal, and ochre are also popular in summer. Fall Colors: Autumn is a brilliantly colored season, and reds, oranges, browns, and yellows are the most popular fall wedding hues. Winter Colors: A chilly season does not mean colors must be icy, and holiday shades, pale blues, and rich jewel tones are popular winter wedding colors. Both similar and contrasting colors are beautiful. Finding the right wedding palette can be a challenge, but couples can find inspiration for their wedding color ideas from many sources, including nature, personal preferences, culture, and couture fashion. Whatever the colors you choose, however, will create a stunning celebration as full of color as the relationship you are celebrating.